Casting: The roles of the nine adolescent girls incarcerated as adults in adult prison have been cast. They include five young emerging actors who are recent Point Park and Pitt graduates and four talented CAPA students. Individually and as an ensemble, they will bring these characters to life on the stage. I am holding auditions now for the adult roles and expect to have those filled by next week. We’ll begin actual rehearsals in early September. New Funding: I’m pleased to report that the Day Room Window project has been awarded a $10,000 grant from the Pittsburgh Foundation and a $4,000 grant from the Three Rivers Community Foundation. These are in addition to the $6,000 Sprout Fund Seed Award secured earlier in the year as well as a number of individual contributions. We’ll continue to seek funding through the summer. Suggestions for possible funding sources are most welcome. 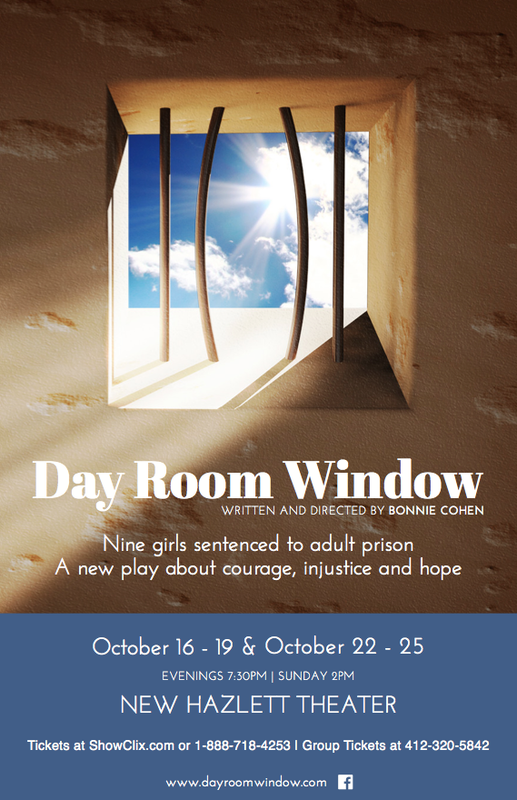 Come to the Theatre: Please consider attending a performance of Day Room Window in October as part of a group. You’ll experience the power of theatre to illuminate, engage and enthrall and as a group you may be able to qualify for reduced ticket prices. You can purchase tickets directly from our site. It’s About the Kids: I had the honor of sharing my experience working with girls incarcerated as adults in adult prison – the basis for Day Room Window – at a mini-conference titled ‘The Unique Needs of Girls in the Juvenile Justice System’ organized by The Girls Coalition on June 17th and held at Gwen’s Girls. It was a very informative and necessary event. Thanks to the Girls Coalition of Southwestern Pennsylvania for organizing it. It’s true. It does take a village – in this case to bring a play and the issues it raises to life. I want to thank each of you for being part of that village through your support, interest and enthusiasm. Keep in touch with Day Room Window right here on our website as well as our Facebook page. I’ll keep you posted as we get closer to the October opening but please contact me, Bonnie Cohen, with any questions, comments or suggestions you might have.